I was completely overwhelmed. I have never experienced anything close to this and I could see the same expression in the eyes of the people walking beside me into the Olympic stadium in Seoul…Thousands of voices were chanting at once: “WE WANT PEACE, WE NEED PEACE.” I thought at that very moment that we were one step closer to ending the Palestinian-Israeli conflict. >>Watch Wasim's WARP Summit Speech! My colleague Mohammad Asideh and I had the privilege to not only represent OneVoice, but Palestine as well, at the World Alliance of Religions’ Peace Summit (WARP) in Seoul, South Korea from September 17 – 19. The summit is a gathering of secular and religious world leaders who are intent on discussing ways to achieve world peace. The summit was organized in the hopes of creating a platform for dialogue between community leaders on national, cultural, spiritual, and ethnic levels. OneVoice was among 205 organizations participating in the summit. While the majority of representatives I met either worked for humanitarian organizations and/or are members of peace forums or youth groups, there were also hundreds of community leaders from around the globe, as well as business and religious leaders, public figures, and politicians. Mohammad and I were engaged in a global discussion on conflict resolution and peace building. The event started with an opening ceremony in Seoul’s Olympic stadium with almost 100,000 people in attendance. Earlier that day, we were informed that the opening ceremony will take place inside a stadium, but I could never imagine this huge number of people standing and cheering for us, representatives of the world’s youth organizations. Thousands of voices were chanting at once: “WE WANT PEACE, WE NEED PEACE.” I thought at that very moment that we were one step closer to ending the Palestinian-Israeli conflict. Many of the world’s leaders spoke during the opening ceremony, calling to mobilize youth to start building peace in areas traumatized by conflicts. It was truly an inspiring event for many of the young representatives who attended the summit seeking to contribute to world peace. [Text Box: Leaders from different religions preparing to sign the first unity of religion agreement in Seoul] The second day of the summit featured speeches by religious leaders about peace and tolerance for the greater good of mankind. I do not recall seeing so many representatives of the all world’s religions in one place. The topic of religions uniting for global peace was discussed and the leaders signed the first ever unity of religion agreement. The agreement will be presented to the United Nations in the months to come. The last event of the WARP Summit was held on September 19. I was asked, along with three other representatives from other youth organizations, to speak about my vision for peace. 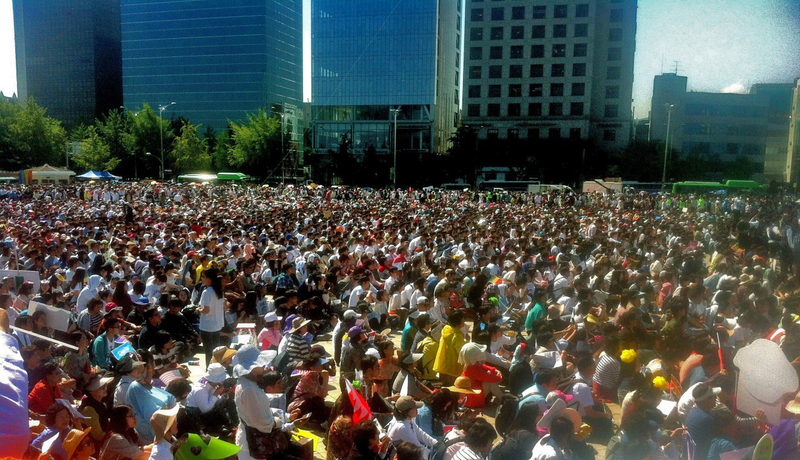 Around 10,000 people were attending the event in Seoul’s Peace Plaza. I was humbled by the encouraging words I received after my speech, which you can watch on our YouTube page. It delights me to know that I raised awareness and generated even the smallest of momentum toward ending the occupation, and therefore the Palestinian-Israeli conflict. It was a unique experience that I will cherish for the rest of my life. The third day ended with the walk of peace in the Peace Plaza in Seoul. The guests and volunteers who joined us during the summit walked side by side chanting for world peace and calling for an end to all forms of violence. It was not the longest of walks, but it was definitely a giant step forward in uniting peace makers for a common cause. My trip to Seoul is over. I am back in Palestine with my wife and daughters. Once I crossed the borders and stamped my passport at the Israeli customs I remembered why the work of young political activists is more important than ever. The feelings of insecurity and hopelessness haunted me for the past year. I can see skepticism in the eyes of my people every time the word peace is mentioned. There is no escape of the bitter reality of the occupation, but for thousands of young Palestinians, organizations like OneVoice continue to provide a platform to protest this reality and build consensus about the two-state solution based on a just peace agreement. The World Alliance of Religions’ Peace Summit in Seoul inspired me to continue working for a better future for my children, a future where Palestinians have their rights, freedom, independence, and peace with their neighbors. *Wasim Almasri is OneVoice Palestine's Communications Officer.